Oregon's State Exchange May Be Worse Than HealthCare.gov : Shots - Health News Oregon's health exchange has yet to enroll a single person. 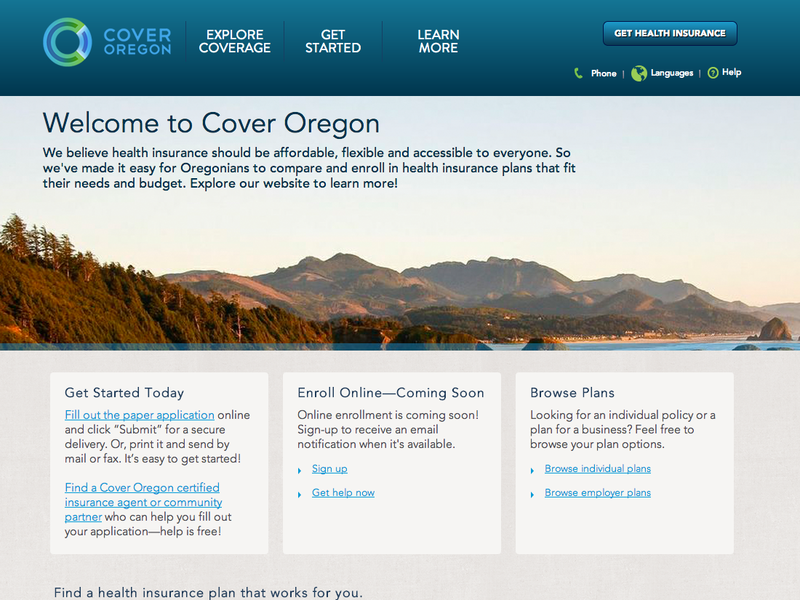 Problems with Cover Oregon's website have reduced the state to asking people to submit paper applications for insurance coverage. Then the state has to send them back a form saying how much that insurance will cost. Then a person would send it back to actually enroll. As the federal government consumes humble pie over failures in the health insurance exchanges, some states that have set up their own exchanges are also struggling. Oregon has yet to enroll one single person, and it's been reduced to pawing through paper applications to figure out eligibility. When Cover Oregon opened Oct. 1, executive director Rocky King was excited. He'd been preparing for years. "Day one, we are accepting applications. 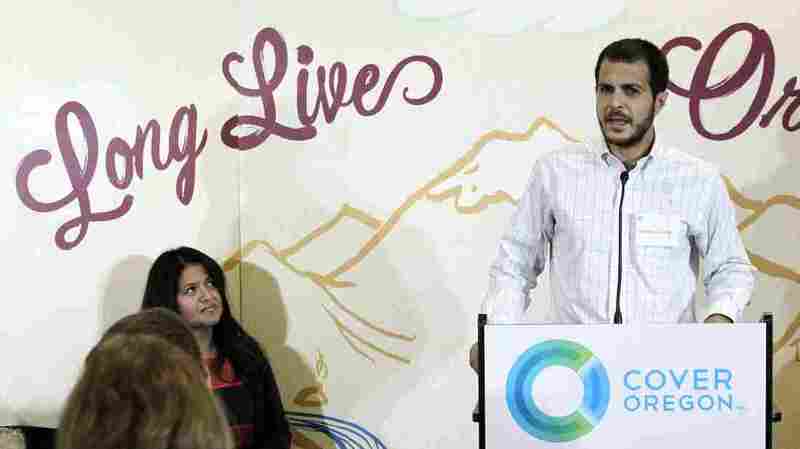 And staff at the Oregon Health Authority and Cover Oregon are ready to process those applications," he said on opening day. Back then, King conceded there were still glitches with the website, but he said that by mid-to-late October they'd be worked out. Now it's November, and it's clear that a quick fix is not in the cards. So Cover Oregon has turned to old-fashioned paper applications. People can either download one off the website, or have somebody walk them through it. NPR made a request to visit a call center to see the process but was turned down for security reasons. Instead, spokeswoman Amy Fauver explained how it is working. "We have on our website right now a place where people who just want to wait, who just want to do it electronically, can give us their e-mail address, and we will e-mail them when the system is fully functional," she said. Cover Oregon's website asks people to fill out a paper application online, and then submit it electronically or by mail. "We also hear from a lot of people who are really chomping at the bit to get started. And they want to send in their paper application as soon as they can. Either way is fine with us." Some potential customers are frustrated, though. Amanda Thomas lives in Oregon but works for an Australian company putting up science exhibitions. As an independent contractor, she has to buy her own health insurance. She says she didn't have good luck on the site when she tried to sign up. Instead, she was guided to a list of insurance brokers. "What I ended up doing was calling one of the brokers, literally just picked one off the screen at random, called him and he explained the whole situation in much more detail and much more understandably," says Thomas. "And his advice was wait and sign up later." The paper application is 20 pages long and asks for everything from names and the number of people in your household to pension contributions and alimony payments. Cover Oregon's Fauver says applicants need to fill it in and send it back. "And then we do an eligibility determination in house, on their behalf." That means Cover Oregon staff will comb through documents to determine if the person is eligible for a tax credit or for Medicaid. The sporadic functionality of the federal government's HealthCare.gov website means this eligibility check is a problem. But Cover Oregon's software is also troublesome. "When we run a test case, a test household to determine eligibility, most of the time it works just fine. But there are times when it doesn't," Fauver says. "It tends to happen more often with more complex households." When the computer system is working, Fauver says that applicants get one of three responses: eligible, not eligible or pending — meaning further communication with Cover Oregon staff is necessary. "We need to get to a place that we are assured that when the system gives a determination, that it's correct," she says. Cover Oregon hopes to avoid what happened to their northern neighbor. Washington State's exchange recently informed 8,000 applicants that they did not, in fact, qualify for as large a tax credit as they'd been told. But back at Cover Oregon, let's say everything is fine and an applicant is eligible for a tax credit. Then, says Fauver, "We send them a packet that includes the amount of the tax credit; the different plans that are available to them; and the costs of those plans and a form that they can fill out to say, 'I want plan A.' Then they sign that form and send it back to us." All of this on paper. Cover Oregon's current guess on when the site will be fully running is by the end of November. So far, it has a stack of 7,300 paper applications, with more coming in each day. It has 45 days to process each one, but it hopes to do that more quickly.